Over the last year, we’ve taken a hard look at our website from a user’s perspective. We’ve counted how many clicks it takes for customers to find what they need. We’ve studied the content that customers have found most useful based on how often certain pages of our website are visited. Above all else, we’ve learned that you’re typically here for one purpose: to find a seed mix, individual species seeds or bioengineering materials based on your site type or project – right away – without having to work to find it. Who are we to stand between you and a satisfying seed purchase? As a result of all our research, we identified a multitude of opportunities to streamline your experience through a new website. This new site represents a complete re-imagining of our web presence, with a focus on the customer experience above all else. It gets right to the business of providing information useful in your seed purchasing experience. One of the key features of the site is the powerful new Seed Finder Tool, which we hope will soon become your main method for searching both mixes and individual species. The Seed Finder Tool allows you to search for seeds by product type (mixes or individual species), by common or botanical name, or any combination thereof. You can also select various detailed search criteria such as botanical categories, site types, pH requirements, height, pollinator value, flower color and bloom period – all of which help you drill down to identify the most appropriate mixes or individual species for your needs. Want to keep a record of the items you’ve requested quotes for, or just maintain a “wish list” for future reference? The all-new Project Planner allows you to build your own project boards with items you wish to submit for a quote, save for future reference, print or share with friends or coworkers via email or social media. We’ve earned a proud reputation as a thought leader in the native seed industry, and as a resource for information, academic research and collaboration. 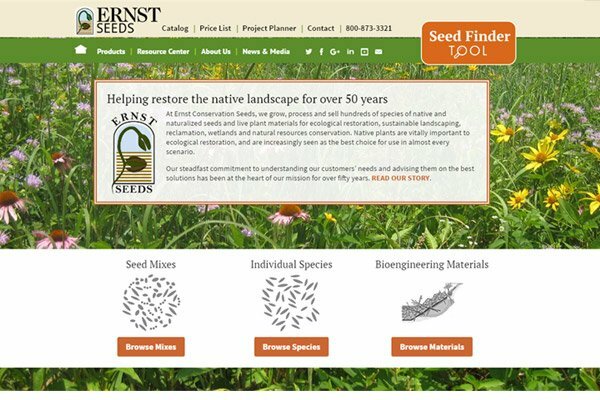 Our Resource Center is full of useful information, links and downloads to not only help you make an informed seed purchase, but to help you after the purchase with information on establishing your seeded site, what to expect during the life cycle of a meadow and external resources to enrich your understanding and appreciation for native seeds and live materials. Our News and Media area will keep you up-to-date via a live Ernst social media feed, a new blog that will feature articles from top influencers in the use and application of natives in various applications, press releases, clippings and a calendar of events featuring industry-specific conferences, meetings and symposia, as well as public events you can add to your own calendar. We also now provide an opportunity for customers to join our email list so we can communicate periodically via an e-newsletter, or with important seasonal or product-specific information of interest to you. We hope you enjoy this new website and bookmark it as your favorite native seed resource site. If you have any questions or comments, or simply need assistance with navigating the site or finding what you need, please contact us.